Wishes:In Darla’s memory a donation may be made to the Canadian Cancer Society or the Miramichi SPCA. 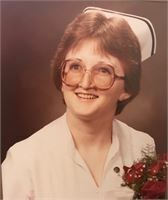 The death of Wandlyn Darlene "Darla"(Silliker) Fenelon RN, wife of Terrance (Terry) Fenelon occurred at the Miramichi Regional Hospital with her loving family by her side on Tuesday, January 22, 2019 at the age of 60. Born in Newcastle, NB, Darla is the daughter of Anna Silliker and the late Myles Silliker. Darla was employed as a Registered Nurse with the former Hotel Dieu Hospital and the Miramichi Regional Hospital for over 35 years. Darla loved to play cards, especially her many skipbo tournaments with Terry. She also loved to travel and enjoyed camping and spending time with her family. She was also renowned for her generous spirit, giving to others without hesitation. Besides her husband Terry and her mother Anna, Darla is survived by her daughter Jennifer Phillips of Newcastle, NB; her son Shannon of Fredericton, NB; her two sisters: Twilight Taylor (Grant) of Lacombe, AB, Phyllis Thurott (Scott) of Riverview, NB; her two brothers: Roy (Ellen) of Whitneyville, NB, Brett (Christine) of Sillikers, NB, her beloved granddaughter Sophia Phillips, her grand puppy Stella and her several nieces and nephews. Visitation will be held at Bell’s Funeral Home on Friday from 2-4 & 7-9 PM. Mass of Christian Burial will be celebrated from Saint Mary’s Roman Catholic Church on Saturday, January 26, 2019 at 11:00 AM with Father Antonio Reyes officiating. In Darla’s memory a donation may be made to the Canadian Cancer Society or the Miramichi SPCA. If you wish condolences can be made online on our website at www.bellsmeadows.com.